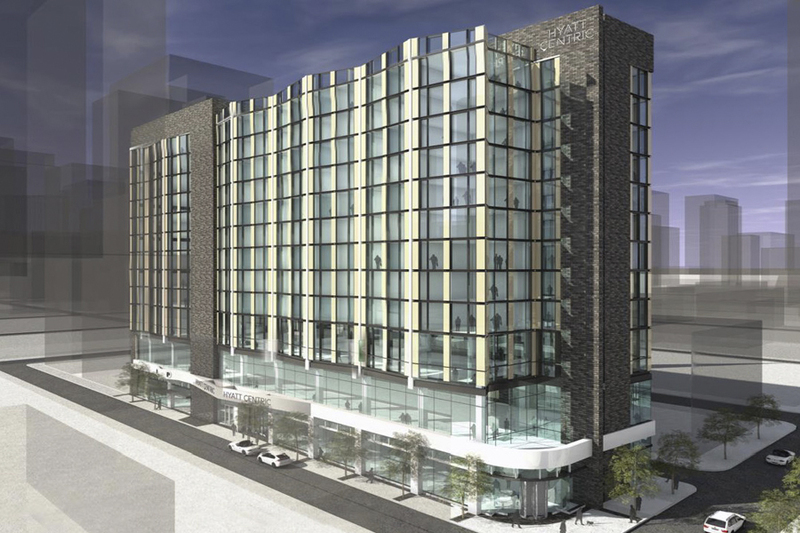 Tucked in between two of Philadelphia’s side streets that parallel the major grid lines of the city, the new Hyatt Centric Philadelphia will occupy a long, narrow site and will take the place of an old and underwhelming parking garage. The building will be modern but won’t be an overbearing influence on its historic neighbors in the upscale Rittenhouse Square district. It will be located in a fairly dense and busy section of Center City, with shopping, restaurants, tourist attractions, and one of Philadelphia’s most famous parks- Rittenhouse Square, nearby. Noise control is a very important issue on this project in several different respects. Exterior to interior noise reduction is always a concern in buildings located where traffic and pedestrians are likely to be in close proximity throughout most of the day and night. Sound transmission between floors, between rooms, and from the public spaces into the guest rooms is also an issue requiring analysis and solutions in the design phase to prevent problems before they arise after construction. In addition, the mechanical and HVAC systems require comprehensive analysis to determine anticipated sound levels and vibration which could potentially affect the noise levels in the rooms and public spaces in the hotel. Metropolitan Acoustics has been involved with the architects throughout the design phase of this project and will be consulting, conducting site visits, and performing testing throughout construction to monitor the progress and make sure our recommendations are being implemented and that they are achieving their expected results. We are also providing acoustical consultation on many of the public spaces in the new building, including the lobby, lounge, restaurant, fitness center, and meeting rooms. We are calculating reverberation times based on the architectural drawings and providing detailed analysis and recommendations that include specific finish materials and products to be used in order to meet the proposed design criteria. Starting with the schematic design phase and working with the project team all the way through construction will ensure that the acoustics and sound isolation goals on this project which were outlined at the beginning are realized at the end.